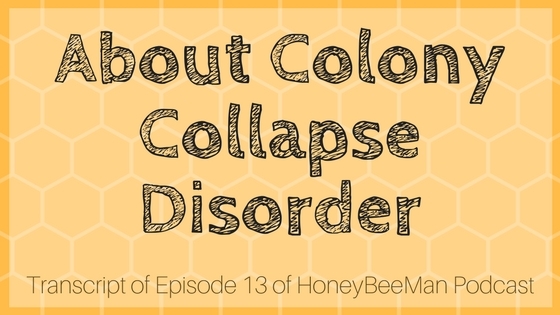 Today we’re going to talk about what has been called the Colony Collapse Disorder. What has been going on is that a lot of beekeepers have lost an abnormal amount of bees for the winter. It’s not unusual for beekeepers to lose about 20% of their hives in the winter climates. This winter it has been a rough winter for hive losses. Some of the commercial beekeepers have lost more like 50% of their bees, rather than the normal 20%. This causes concern because of the pollination. You’ll remember that pollination is probably the most important thing that the bees do for us. They pollinate food crops for the rest of our fruits and vegetables that we eat every day. Losing this many bees is a real concern. Will these beekeepers be able to recover financially from this loss? I’m sure that they will. They’re not unlike other agriculture farmers. Farmers go through the same thing when they have a bad season. This one is a little strange because nobody knows exactly what is causing this. What’s going on? Well, bee numbers on the East coast and in Texas have fallen more than 70%. California has seen colonies drop by 30-60%. Around the Cincinnati area, losses anywhere from 25-50%. The beekeepers who do pollination and travel with their bees, they move their bees around a circuit following the pollination blooms, these guys seem to be having more heavy losses than the beekeepers who don’t move their hives around. We don’t really know what’s the cause of this. Some of the scientists are explaining that they think it may be contamination of different chemicals in the hives. There are some people that think this is what happens when there are genetically altered crops (GMOs). There are certain crops that are genetically altered to resist insects. Honeybees are an insect and they would be carrying back these contaminated DNA or whatever chemicals back to the hives. If they put something in the crop that resists insects and the bees happen to bring that back to the hive, there is a possibility that you could be getting some contamination that makes the bees disappear. It appears to be, from what scientists are saying, a problem where the bees actually get disoriented and don’t return to the hive. What’s happening is the hives are just empty. They may be a queen in the hive, she may have a handful of bees, but the vast majority of the bees just fly off and don’t come back. That’s highly unusual. In a normal hive, the queen would never leave the hive and the workers would stay right there with the queen. The only reason that they would be out of the hive is to go get nectar, pollen, or water to bring back to the hive. This is a major problem. I’ll talk for a minute on what you do if you’re a beekeeper and you lose 50% of your hives. First of all, let me explain that if you lose this many bees, this is absolute financial devastation for some folks. Just as a rough average, these hives are worth somewhere around $200 apiece. I’m just throwing that number out. It totally depends on what kind of equipment you’re using, when you’ve purchased your equipment and so forth. Some people may have purchased their equipment many years ago and it’s still good equipment, so they don’t have that much money in it. As a general rule, these hives are worth a couple hundred dollars apiece. A good quality queen nowadays will cost anywhere from $10 to $20 dollars each, or more. So the queen alone is worth $20. Let’s say that you order packages of bees. A package of bees sells for anywhere from $45 up to about $100, depending on where you buy it and how it’s delivered. The delivery cost gets a little high depending on your location and weather. The cost of losing these packages is a pretty big loss. Then, on top of that, you have to ask yourself the question, “Why did the bees take off from that hive?” If there is something contaminated in that hive, there are things that we can do to clean out these hives. The wax could be melted down and then you could start over with new wax. That’s a huge amount of work. It’s not going to be a financial win, no matter what. It’s really a major financial loss. To recover from this, what a beekeeper will have to do is take their bees somewhere that there is a nectar flow. They’ll typically have to feed their bees with sugar to give their bees a good head start. Then they’ll either split the hives or re-queen the hives. If you split them, you’re taken back at least 30 days, if not more, because you have to let the bees raise a new queen. If you purchase queens, you have the cost and expense of purchasing queens. You can see that if you just replace the hive with package bees, you’re talking about spending at least $50 to replace each hive. You can imagine if you have 2,000 hives and you lose half of that, $50 for every single hive that you want to replace. That’s not including feeding the bees or anything else, that’s just the cost of the bees themselves. If you’re a commercial beekeeper and you have to transport your bees somewhere down south where there’s a nectar flow. You have to keep them in that nectar flow until they build back up to the point where you can travel with them again. It’s just a major problem for the beekeeper. It may very well make some of these beekeepers go out of business. We really need the bees for pollination. This is pretty much devastation for the honeybees, it’s devastation for pollination. Hopefully we can recover from this. Hopefully people will be willing to split as many colonies as they can to try to build up the colony numbers. Hopefully none of the big guys will go out of business, we need all the bees we can possibly get for pollination. There’s really a shortage for pollination, especially out on the almond crops in California. That’s all for this lesson. Hopefully you know a little bit more about Colony Collapse Disorder. Unfortunately, I can’t tell you why it’s happened. Hopefully you have plenty of bees left.